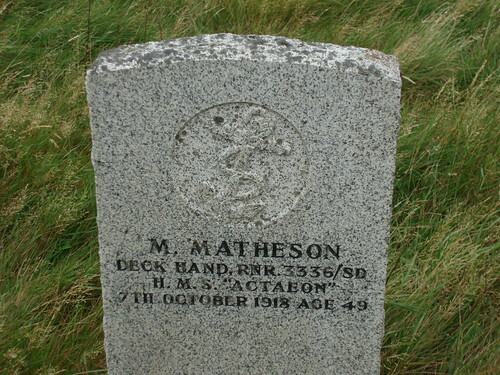 Son of John and Barbara Matheson. Husband of Kate Matheson, of 94, Alderman Rd., Knightswood, Glasgow. Malcolm was one of the children of John (1831) and Barbara (1833), the others being Alexander (1873), Ann (1865), Christina (1863), Christina (1869), John (1861), Mary (1874) and Murdo (1859). Father of Barbara Ann (1904), Catherine, Christina (1898), Hector (1902), John (1908), John Murdo (1900), Mary (1906) and Roderick (1905). The sad news of the death of her husband was received by mrs Matheson, 13 Gravir, on Tuesday last. He died of pneumonia at RNR hospital in Gillingham, Kent. Malcolm was one of the best known fishermen in Lewis and an elder of the United Free Church at Gravir. He was a cheerful and kindhearted Christian and much respected throughout the district. He was home on harvest leave and had only been gone a week when he died. He joined the RNR in 1915.